Congressman Patrick Murphy of Pennsylvania gave a brutally clear interview on NPR’s On Point program yesterday. The whole thing is worth a listen, but a key comment came fairly early on. Murphy was promoting his new memoir and talking about his experience as a member of a unit of the 82nd Airborne in the immediate aftermath of the invasion. As the occupation was beginning, a total of 3,500 soldiers from that division had responsibility for a district of Baghdad that was home to about 1.5 million Iraqis. Bit of background here: Murphy’s dad was (is?) a Philadelphia cop. Murphy had expected to be one himself, but the twists and turns of a somewhat hellraising youth led him to ROTC and a career in the US Army. But he knew from policing, and he’s got Phillie in his bones. The key fact that Murphy gave his listeners is that from a policing point of view, Philadelphia is just about the same size as his area of operation in Baghdad. How many cops does Philadelphia use to police its 1.5 million residents? 7,000. Oh — and a couple of other things: Police officers in Philadelphia speak the local language, live in neighborhoods in (and, to be sure, around) the city, and many if not most have family roots that go back one or more generations into that community. The 82nd Airborne in Bagdad…not so much. To Murphy this was just one more example of how badly conceived and led the Iraq operation was from the beginning. That’s certainly true, and the more important meaning of the comparison. But to me what stood out from that couple of sentences in an almost hour long interview, was the importance of scientific –and more precisely — quantitative reasoning in every day life. One of the great things about real quantitative reasoning is that it is a very efficient way to think about appropriate problems. Individual military engagements, of course, are all different; there are procedures, training and plans you can make to improve your odds of success, but there is no simple algorithm that is going to get your platoon through every contact with the enemy. That is, actually getting right the calculation for the number of spare parts you need to keep a tank running across Russia makes a big difference to your chances of success — see Richard Overy’s excellent Why the Allies Won for details. Coming back to Murphy’s anecdote, the other virtue of quantitative reasoning as applied to Iraq, (besides being essential — i.e. we see what happens when our leaders ignore it), is that it is efficient. It enables you to learn a lot about different courses of action, retrospectively or in prospect. And it does so very quickly. It turns out that in many situations you don’t need much knowledge to be able to infer a great deal more, with great confidence. Simple models based on relatively simple and easy to get data actually can do a lot of heavy lifting. Try this one on for size: what are minimums for policing large urban populations during an occupation? You could start by looking at a few large cities already at peace — Philadelphia for example. We know, thanks to Captain-turned-Congressman Murphy that Philly runs out about one cop for about every 200 citizens. You can take that as a working average for cities with a diverse populaton with some identity divisions between them, a working civil government, an established rule of law, and a common language, shared history, and a fair number of common civic symbolic unifiers — a disdain for Santa Claus at Eagles games and so on. In other words, 1/200 is your starting approximation for policing requirements when you begin to think about taking over the responsibility for order in an unfamiliar territory. You would, if you were the least bit prudent (or if your own skin and those of soldiers under your command were at stake), probably try to work out some of the factors that might alter that number: things like ethnic/sectarian divisions more intense than you were used to; language barriers; the absence of existing civil institutions; the lack of a history of rule of law and so on. The bottom line is that there is no rational way to come up with a number smaller than that required to police a city at peace whose police force patrols with the active consent of the overwhelming majority of the policed. Hence, the decision to station just 3,500 soldiers whose duties included but were not limited to maintaining civil order in an occupied city neighborhood as large as Philadelphia was an obvious error — one of a pattern of blunders that has cost so much for so long. And the key lesson to draw out of all this belaboring of the obvious? It took only two numerical facts to reach that conclusion: the number of police in Phillie; the number of troops in the neighborhoods of Baghdad. You don’t have to be brilliant to think clearly. You just have to choose to do so, and to employ the intellectual tools human beings have spent millenia developing to do so. 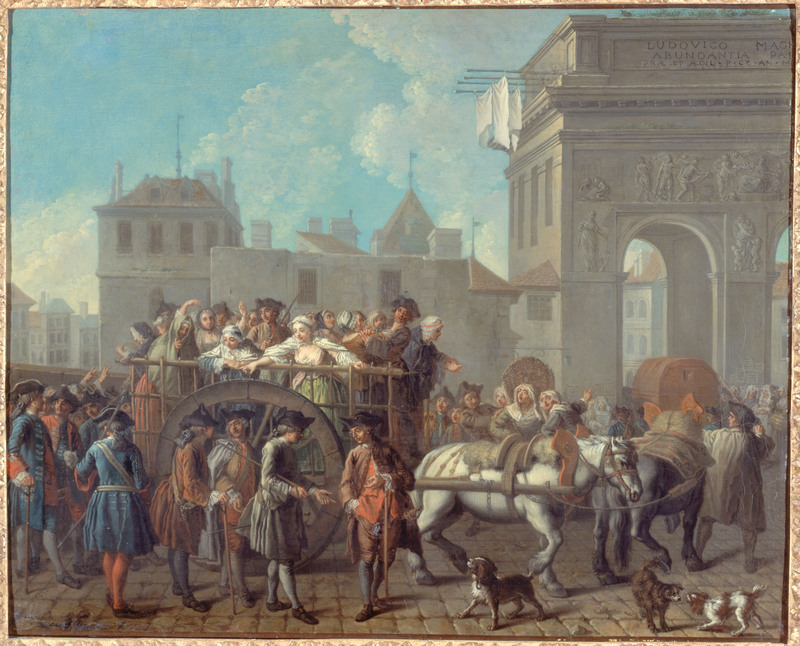 Image: Etienne Jeurat, “Prostitutes transported by the Police,” 1755. Source: (via Wikimedia Commons) The Yorck Project: 10.000 Meisterwerke der Malerei. DVD-ROM, 2002. Licensed under a GNU Free Documentation License. Categories: Bush follies, good books, Iraq, Mathematics, numbers, Politics, radio, Uncategorized, War, Who needs science?